In the current work, the natural zeolite was modified with cobalt hexacyanoferrate and employed for adsorbent of Pb(II) ions from aqueous solution. The modification was approved by XRD and FTIR techniques. The Pb(II) adsorption capacity enhanced by 1.8 times from 60 mg/g (natural zeolite) to 100 mg/g (modified zeolite) at optimal conditions. Factors such as time, pH, temperature, adsorbent dosage and initial concentration were investigated to optimize the adsorption condition. A fast sorption was observed in the initial contact time and equilibrium was achieved in less than 120 min. The optimum pH for lead removal was between 3 and 6. The adsorption capacity was increased and reached the maximum of 90 % at 2 g/L adsorbent dosage. Also, the adsorption increased as the concentration increased up to 500 mg/L and the sorption became constant at higher concentration. It was found that the double-exponential model describes the lead sorption kinetics and the Langmuir–model describe the isotherms. being discharged into the environment water system. Since the compounds of the Leads can accumulate in the body and cause severe saturnine poisoning such as lesions in the central nervous system, brain damage, mental deficiency, anemia, anorexia, vomiting and malaise, the lead is considered as highly toxic to human health . Today one of the serious problems is contamination of surface and groundwater with heavy metals ions such as Pb(II) ions. So the removal of Pb(II) from wastewater before discharge is important . The techniques such as chemical precipitation, flocculation, electro-flotation, ion exchange, reverse osmosis, evaporation, and adsorption have been used for uptake of Pb(II) from water, . The application of more effective and environmental friendly method is very important for removal of Pb(II) ions. Some of the mentioned techniques have unreliable efficiencies or cause secondary pollution . The adsorption is considered as an effective, selective and easy to perform a method for the removal of Pb(II) ions from the complex mixtures [5-6]. The zeolites as an adsorbent material have advantages, such as facile availability of raw material sources, unexpensive and pleasure adsorption ability. They are widely used as adsorbents, ion exchangers, and catalysts which could also be used for drying gases, purification and sewage treatment[1-4]. The structures of natural zeolites include SiO4 and AlO4 tetrahedra three-dimensional framework. The small aluminum ion is posited in the center of the tetrahedron of four oxygen atoms, and the isomorphous replacement of Al3+ for Si4+ produces a negative charge in the zeolite lattice. The net negative charge is balanced by the exchangeable cation (Na+, K+, and Ca2+). The exchangeable cations can` be replaced with heavy metal ions in solutions such as Cd(II), Pb(II), Zn(II) and Mn(II) . Pretreatment and modification of zeolite to cleanse the impurities and alter the properties of zeolite surface through anchoring of new adsorption site would affect the adsorption process of zeolite. Fe-modified zeolites were reported to be capable of adsorbing high concentrations of heavy metals in solutions. The porosity and surface area of the zeolite can be improved with a mineral acid or base modifications . The study showed that the modified of zeolites with Al2(SO4)3 increased two times the manganese adsorption capacity of natural zeolites . The highest manganese adsorption capacity is observed in the iron-loaded clinoptilolite . The modification of zeolite with Hexadecyltrimethylammonium surfactant leads to improvement of chromate ions selectivity of product. Metal Hexacyanoferrate ion-exchangers have been widely studied for the recovery of Cs(I); however, a numerous literature is also citing the possibility to use these materials for the sorption of heavy metal ions. Synergistic effects of zeolite and Metal Hexacyanoferrate improve selectivity and adsorption capacity towards metal ions . However, to our best knowledge, no report of the application of modified natural zeolite with cobalt ferrocyanide for removal lead ions has been published in the scientific literature. The aim of the current work was to the treatment of natural zeolite as an adsorbent for Pb(II) removal from aqueous solution. The effects of solution pH, contact time, initial Pb(II) concentration, and adsorbent dosage were investigated. All chemicals used in this study including of CoCl2.6H2O, K3Fe(CN)6, and Pb(NO3)2were analytical grade from Merck Co. The Pb(II) stock solutions were prepared by dissolving the lead nitrate salts in deionized water. X-ray diffraction patterns of the natural and modified zeolites were recorded by means of an STOE XD-3A X-ray diffractometer (Cu K𝛼 radiation, k = 0.154 nm, 40 kV and 30 mA). The Infrared spectra of the natural and modified zeolites were recorded by means of a BOMEM MB-series FTIR spectrometer within the wave number range of 250 to 4000 cm-1 after pelleting with KBr. The modification of natural zeolite was performed according to our previous work . 5 g of the dried and powdered zeolite was added to a 100 ml solution of 0.1M Co(NO3)2 at 25 °C for 2 hours. Then the zeolite was washed and mixed with a 100 ml of 0.1M K4Fe (CN)6 solution to deposition of the CoHCF in the surface and channels of zeolite. Then the treated zeolite was washed and dried at 60 °C for 2 hours. Where v(L) is the volume of Pb(II) solution, Ci (mg/L) is initial Pb(II) concentration, Ce(mg/L) is final Pb(II) concentration, and w(g) is the mass of the solid phase. The effect of contact time, initial concentration, pH, adsorbent dosage and temperature parameters were studied to determine the modified zeolite properties and the adsorption parameters. The XRD patterns of the natural and modified zeolites are shown in Fig. 1. The characteristic reflection peaks at 2θ= 10°, 11.3°, 13.2°, 22.5°, 27°, 30.02° and 32°, respectively ( belong to clinoptilolite) can be seen in the two samples . In modified zeolite in addition to the clinoptilolite peaks, the characteristic peaks at 2Ѳ = 40◦, 50◦, and 55◦ correspond to (420), (422) and (440) plane of the crystal structure of cobalt hexacyanoferrate also can be seen in pattern (JCPDS card no: 46‐907) which it confirms successful modification of zeolite. The FT-IR spectra of the natural and modified zeolites are shown in Fig. 1(inset). A sharp peak which appeared at 2090 cm–1, in the modified zeolite is a characteristic of the cyanide group (C≡N) and confirms the successful modification of the natural zeolite [13, 14]. At first the adsorption capacity of non-modified zeolite and modified zeolite were measured and results indicated that the adsorption capacity were 60 and 100 mg/g for non-modified zeolite and modified zeolite respectively (temperature = 298 K, adsorbent dosage= 0.1 g, initial Pb(II) concentration = 500 mg/g, pH = 3-4 and contact time =240 min ). In the adsorption process, the solution pH plays a key role, because H+ are strong competing adsorbates and influences on metal ion form, the surface charge of adsorbent, and stability of adsorbent in solution. Fig. 2a shows the influence of pH on the uptake of Pb(II) by modified zeolite. It was seen that the adsorption dependent on solution pH and the removal of metal ion was high when 2 <pH < 6. In acidic solution, pH <2 the competition between H+ and metal ions for active sites of adsorbent led to little adsorption of Pb(II). In other words in acidic solution higher concentration and higher mobility of H+ led to the preferential uptake of H+ ions compared to Pb(II) ions. In alkaline solution, 6 < pH the precipitation of Pb(OH)2 and dissolution of adsorbent decrease the uptake value. The influence of modified zeolite dosage on Pb(II) adsorption was studied in 0.5- 6 g/L dosage ( Fig. 2b). The adsorption capacity was increased with the increase of adsorbent value and reached the maximum of 90 % at 2 g/L adsorbent dosage. Then the increase in dosage caused a slight effect upon ion adsorption. The improvement of adsorption with increasing adsorbent dosage can be attributed to the increase of surface area and available adsorption sites . Slight change of adsorption capacity with more increasing of adsorbent dosage can be attributed to overlapping of the adsorption sites as a result of overcrowding of adsorbent particles. Also at the high adsorbent dosage, the screening effect led to shielding the binding sites of adsorbent from metal ions. Two main removal mechanisms of Pb(II) by adsorbent are physical adsorption (by negative lattice charge) and ion exchange by cobalt ferrocyanide (K+ by Pb2+) and cations of zeolite. The cobalt ions didn’t contribute in ion exchange. In fact, the high surface area of zeolite and high adsorption affinity of cobalt ferrocyanide lead to synergistic effects of zeolite and metal Hexacyanoferrate and improve selectivity and adsorption capacity towards metal ions. The effect of temperature on the adsorption of Pb(II) on the modified zeolite was investigated at 298, 313 and 333 K (Fig. 2c, d. Table 1). Temperature change results in changes related to both kinetics and equilibrium of adsorption process. Change in the mass transfer resistance, the thickness of the boundary layer surrounding the adsorbent, surface activity of the adsorbent and kinetic energy of the metal ions are the results of temperature change in the adsorption process. As shown, by the increase of the temperature the adsorption capacity was decreased which indicating that the process was endothermic. Where Ce and CS is the equilibrium concentration of Pb(II) on adsorbent (mg/L) and in the solution (mg/L). The negative value of ΔH indicating the exothermic nature of Pb(II) adsorption on the modified zeolite. The negative value of ΔS reflects an ordered arrangement of ions around adsorbent particles (at solid/liquid interface) and the negative ΔG indicate the spontaneous nature of the process. The rate of adsorption is one of the important criteria for the efficiency of adsorbent and also the mechanism of adsorption can be concluded from kinetic studies. Therefore the study of adsorption kinetics is vital in the adsorption process. So for optimize of experimental condition and determine of kinetic parameters, the sorption capacity was measured at different interval contact times (15-480 min, at 298 ͦ C). The result indicated that in the initial contact time equilibrium was achieved (in less than 120 min). At initial contact step, the arge concentration gradient between the solution and adsorbent surface lead to increasing of adsorption rate . Then, the adsorption rate is diminished, because more sorption sites were occupied . The pseudo-first-order, pseudo-second-order, double-exponential, Elovich, and intraparticle diffusion models were used for the fitting of the experimental data (Fig. 3, Table 2). where qe and qt are the amounts of the ions adsorbed (mg·g−1) on the modified zeolite in equilibrium and at time t, respectively, and K1 (min−1) is the rate of the constant adsorption. where k2 is the rate constant of the pseudo-second-order equation (g/mg min)[9-11]. Where kad is the rate constant of intraparticle transport (mg/g min1/2), and c is the boundary layer diffusion [9-11]. Where q represents the number of ions adsorbed at time t, a desorption constant, and α the initial adsorption rate [9-11]. where D1 has rapidly adsorbed fractions of ion (mg/l), D2 is the amounts of slowly adsorbed fractions of ion (mg/l), and KD1 and KD2 are rapid and slow rate constants (min–1) respectively. The model parameters of the slow and rapid steps extracted from the experimental data are presented in Table 2. Where qe (mg/g) is the amount adsorbed per unit mass of adsorbent at equilibrium concentration; Ce (mg/L) is the equilibrium concentration of the adsorbate; qmax (mg/g) is the maximum adsorption capacity; b is the adsorption equilibrium constant, characteristic of the affinity between the adsorbent and adsorbate [11-17]. Where B (J/mol) and AT (L/g) are the constants related to the sorption heat and Temkin isotherm equilibrium binding respectively. From the slope and intercept of the qe vs. lnCe curve, the constants could be determined. Where Ce is the adsorbate equilibrium concentration (mg/lit) . The cobalt ferrocyanide modified zeolite was applied for removal of Pb(II) from aqueous media. The Pb(II) adsorption capacity was increased from 60 to 100 mg/g by modification of natural zeolite. The equilibrium was achieved in less than 120 min. The optimum pH was between 3 and 6. The adsorption capacity was increased and reached the maximum of 90 % at 2 g/L adsorbent dosage. The adsorption increased as the concentration increased up to 500 mg/L and the sorption. Scenedesmus obliquus, Desalin. Water Treatو. 52 (2014) 7906-7912. 2. Jiang M-q, Jin X-y, Lu X-Q, Chen Z-l. Adsorption of Pb(II), Cd(II), Ni(II) and Cu(II) onto natural kaolinite clay. Desalination. 2010;252(1-3):33-9. 3. Kul AR, Koyuncu H. Adsorption of Pb(II) ions from aqueous solution by native and activated bentonite: Kinetic, equilibrium and thermodynamic study. Journal of Hazardous Materials. 2010;179(1-3):332-9. 4. Liu Y, Liu Z, Gao J, Dai J, Han J, Wang Y, et al. Selective adsorption behavior of Pb(II) by mesoporous silica SBA-15-supported Pb(II)-imprinted polymer based on surface molecularly imprinting technique. Journal of Hazardous Materials. 2011;186(1):197-205. 5. Benguella B. Cadmium removal from aqueous solutions by chitin: kinetic and equilibrium studies. Water Research. 2002;36(10):2463-74. 6. M.E. Ulmanu, E. Maran, Y. Fernndez, L. Castriln, I. Anger, D. Dumitriu, Removal of Copper and Cadmium Ions from Diluted Aqueous Solutions by Low Cost and Waste Material Adsorbents, Water Air Soil Pollut., 142 (1–4) (2003) 357–373. 7. Ćurković L, Cerjan-Stefanović Š, Filipan T. Metal ion exchange by natural and modified zeolites. Water Research. 1997;31(6):1379-82. 8. Wen J, Yi Y, Zeng G. Effects of modified zeolite on the removal and stabilization of heavy metals in contaminated lake sediment using BCR sequential extraction. Journal of Environmental Management. 2016;178:63-9. 9. Ates A. Role of modification of natural zeolite in removal of manganese from aqueous solutions. Powder Technology. 2014;264:86-95. 10. Doula MK. Removal of Mn2+ ions from drinking water by using Clinoptilolite and a Clinoptilolite–Fe oxide system. Water Research. 2006;40(17):3167-76. 11. 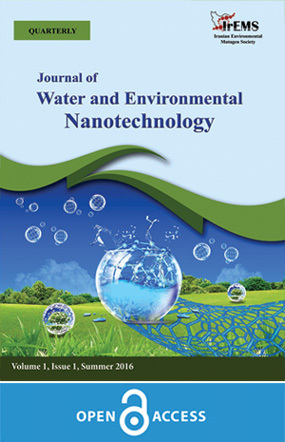 T. Yousefi, H. R. Moazami, H. R. Mahmudian, M. Torab-Mostaedi, M. A. Moosavian, Modification of natural zeolite for effective removal of Cd(II) from wastewater, J. Water Environ. Nanotechnol., 3(2) (2018) 150-156. 12. Smičiklas I, Dimović S, Plećaš I. Removal of Cs1+, Sr2+ and Co2+ from aqueous solutions by adsorption on natural clinoptilolite. Applied Clay Science. 2007;35(1-2):139-44. 13. Yousefi T, Yavarpour S, Mousavi SH, Torab-Mostaedi M, Davarkhah R, Mobtaker HG. FeIII x SnII y SnIV1−x−y H n [P(Mo3O10)4]·xH2O new nano hybrid, for effective removal of Sr(II) and Th(IV). Journal of Radioanalytical and Nuclear Chemistry. 2015;307(2):941-53. 14. M. Kazemimoghadam, Z. Amiri Rigi, Evaluation and synthesis of Nano-pore Hydroxysodalite (HS) zeolite membranes: Application to pervaporation of Ethanol/water mixture, J. Water Environ. Nanotechnol., 3(2) (2018) 173-190. 15. Zhou T, Xia F, Deng Y, Zhao Y. Removal of Pb(II) from aqueous solutions using waste textiles/poly(acrylic acid) composite synthesized by radical polymerization technique. Journal of Environmental Sciences. 2018;67:368-77. 16. M. Moses,M. Mbugua Margaret, M. Nga’ng’a Benson Wachira Harun. Mbuvi, Removal of Lead Ions and Turbidity from Waste Water by Adsorbent Materials Derived from Cactus Leaves, J. Nat. Sci. Res., 6 (2016) 63-72. 17. Yousefi T, Mahmudian H, Torab-Mostaedi M, Moosavian M, Davarkhah R. Anchoring of CoHFC nanoparticles on clinoptilolite for remedy of nuclear wastes. Nuclear Technology and Radiation Protection. 2017;32(1):25-36. 18. Sarkar M, Banerjee A, Pramanick PP. Kinetics and Mechanism of Fluoride Removal Using Laterite. Industrial & Engineering Chemistry Research. 2006;45(17):5920-7. 19. Cortés-Martínez R, Olguín MT, Solache-Ríos M. Cesium sorption by clinoptilolite-rich tuffs in batch and fixed-bed systems. Desalination. 2010;258(1-3):164-70.